Conversations between artists both verbal and visual are the flavour of the month: the big voice of Picasso is almost but not quite drowning out a septet of British artists over at Tate Britain. Now joining the chorus is a fascinating exploration of the 1930s, in which the Brit Ben Nicholson and his Dutch friend and colleague Piet Mondrian are described by that hotbed of art history, the Courtauld, as "leading forces of abstract art in Europe”. To make the point about both the conversation between Nicholson and Mondrian and the results, the Courtauld has put on a thoughtful, succinct exhibition – the gallery can do in two rooms what for most museums would take ten – based on its own exceptionally agreeable 1937 (painting) by Nicholson (pictured below left). But why does Mondrian have an international reputation as one of the leading painters of the 20th century and Nicholson, over 20 years his junior, a leader only in Britain? To the visitor the paintings and reliefs seem startlingly different, though the scaffolding can seem touchingly similar. 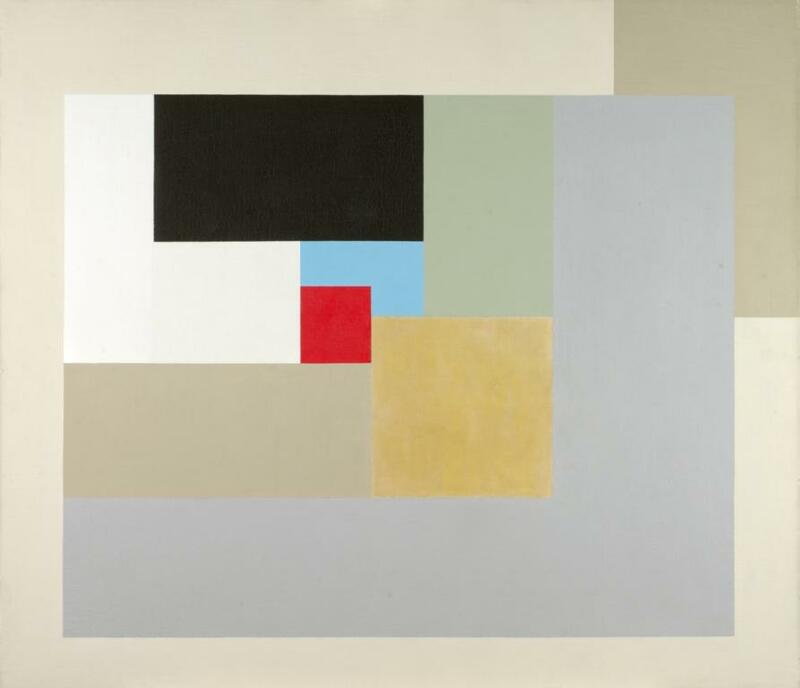 Nicholson’s carved white wooden relief, 1938 (white relief) and Mondrian’s Composition No 1 with Red, 1939, are almost like echo chambers in terms of composition. There is a shared sense of spatial relationships, and a pared down vocabulary of lines, squares, rectangles, no curves from Mondrian, an occasional circle from Nicholson. Mondrian’s Composition B/(No II) with Red, 1936 and Ben Nicholson’s 1936 (white relief) are equally fascinating as a pair, the Mondrian using a square of dazzling red in the top left hand corner, the Nicholson using a carved white circle as the protagonist. The conversation had been intense. Nicholson, then married to his first wife, Winifred, a fine painter herself, first made Mondrian’s acquaintance in Paris in 1934. Indeed in 1935 Winifred was the first English purchaser of a Mondrian (he was already in collections in America), the masterly Composition with Double Line and Yellow, 1932 (pictured below), which was also the first Mondrian to use a double line: its vibrancy still startles. The friendship further deepened when Nicholson facilitated his colleague’s move from Paris to London in 1938, in effect rescuing him from the Continent. Mondrian, understandably concerned about the political situation in general and his own position in particular (he had featured in Hitler’s notorious Degenerate Art exhibition in Munich in 1937) left his austere studio in Paris and joined the so-called "nest of gentle artists" - of course they were anything but – in Hampstead, which included not only Nicholson but Henry Moore and Naum Gabo. There too was Barbara Hepworth, already Nicholson’s lover and soon to be his second wife. Mondrian had brought his jazz records – he adored dancing – and his unfinished paintings, and set to work. Nicholson’s paintings deploy overlapping planes of relatively soft colours, with a sense of three dimensions, of recessive space. His carved white wooden reliefs sensitively use shadow to suggest line with light. Nicholson’s paintings and reliefs are refined, elegant, pleasing meditations on shape and colour. Mondrian too is pared down, resolutely flat, the paintings anchored by brilliant, punchy primary colours, suspended in an infrastructure of bold black lines, white always as the field. The Nicholsons have a charm that is almost delicate. The Mondrians are striking statements, shape and colour poised in dynamic equilibrium; their rightness of shape, colour, structure is dazzling, their energy after 70 years undimmed. Nicholson’s adventure was to strip out all reference to the observed world; but Mondrian invented a convincing and lasting vision, with an impact that is still reverberating. Who’s afraid of red, yellow and blue? Not Mondrian - he made them his own. When war came, the Nicholsons went to St Ives in Cornwall but Mondrian, urban to the last, headed for New York, missing London but energised by the new world. His late masterpieces were New York Boogie-Woogie and Victory Boogie-Woogie, the latter still unfinished at the time of his death in 1944.